Our small ranch in Rutherford is one of my favorite places when I’m in the mood to reflect and be in the moment. We call it “the farm.” Sitting on top of the reservoir watching the birds come and go and taking in the layered vistas toward Mount St. John across the Rutherford bench; I can’t imagine anything more divine. This is the home of Greer wine, named in honor of my husband Rob’s family heritage. When I first came to this place back in 1985, the original Cabernet Sauvignon vineyard was in its third leaf and first year of harvest. In the early goings, the grapes made their way to Pine Ridge, Tony Soter’s Etude, and eventually into St. Clement’s Oroppas. Around that time, Phylloxera had returned to Napa Valley, and our AxR1 vineyard, like most others, succumbed. After holding out longer than most, we elected to replant, but this time with the plan to make our own wine. Since then our three-acre plot has offered us the rare pleasure and pride of enjoying a wine that begins in our unique Rutherford dust and is finished by Aaron Pott’s skilled hand. Because our wine was blessed with instant acceptance, initially by forum members of Robert Parker’s website, and has continued to receive high praise from customers, Rob has declined to submit our wine to professional reviewers. However, here is a treasured assessment by a customer who, when he wrote this email, was a student, and now reviews wines for robertparker.com. 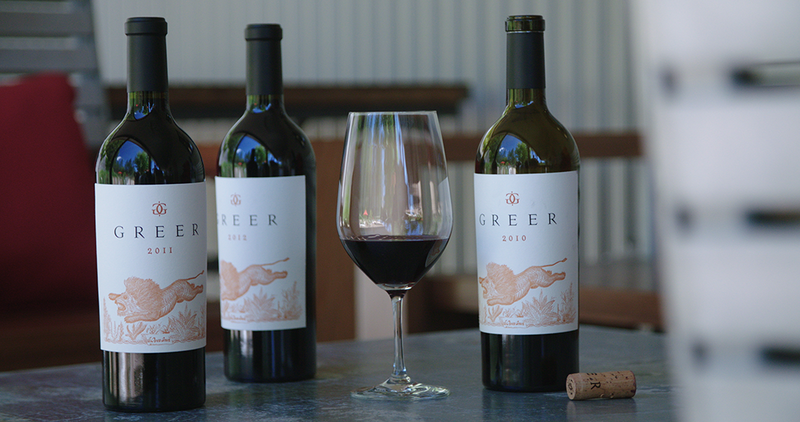 On a recent trip to Switzerland, Rob and I were invited to do a vertical tasting of the Greer, starting with the 2008 vintage. Revisiting the past through our wine, brought me back to the land, the early morning harvests, the barrel tastings and the years of memories made at the farm. I invite you to share in our story by enjoying Greer wine. Please click on the link below to visit the site where you can learn more and sign up for our wine allocation. Click here to view the Greer Wine website.